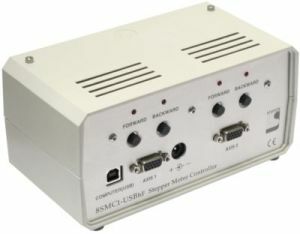 The 8SMC1-USBhF-B1-1MC offers a handheld manual control option that allows for two button directional control of the unit in addition to the USB communication, the buttons are labeled “Forward” and “Backward”. The “Forward” button is intended for moving the positioner “Forward”. The “Backward” button is intended for moving the positioner “Backward”. Two LED’s indicate direction of movement. The LED of interest will flash to indicate rapid movement and will remain constantly illuminated upon reaching the limit switch. The handheld remote is usually used for precise manual positioning of the stage during such processes as calibration. 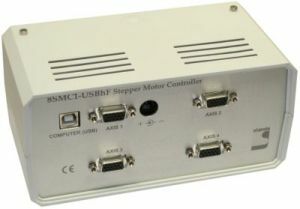 Another common application of is for the control of stepper motors when a computer is not easily accessible. Front panel manual control is available as an option for the 8SMC1-USBhF-B2-2MC. There are four buttons on this front panel: “Forward Axis1”, “Backward Axis1”, “Forward Axis2” and “Backward Axis2”. There are also four LED indicators to show the direction of movement along with limit switch indication. For added flexibility Standa offers the 8SMC1-USBhF series controller in CCA form for ease of integration into custom systems. When ordering the CCA version of the controller the current limit values will still be set by the manufacturer before leaving the factory, but this limit can be changed by the user in the field. The CCA product will also include the USB hub IC and a heatsink for the motor driver IC. Warranty and support options may vary for the CCA version of controller. The 8SMC1-USBhF comes with a suite of advanced software tools that can be utilized to control and adjust your stepping motors. All software tools operate on Windows 2000/XP/Vista. 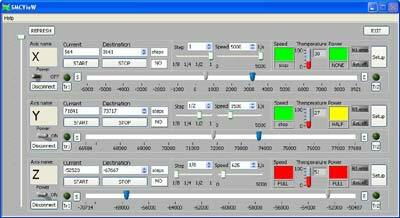 SMCView is a friendly, graphical user interface for controlling, monitoring and adjustment of your stepping motors. It can also be used for easy setup to save and load of all parameters for each stepping mo-tor. This interface supports up to 30 drivers simultaneously. USMCDLL.dll is a dynamic link library for host programming in C/C++, Visual Basic and other languages. It includes all basic commands for stepping motor control. Some examples of these functions are also enclosed. SMC.llb is a set of virtual instruments (VI) for National Instruments LabView 7 programming language. Some examples of these VI’s are also included. - USMCDLL.dll is a dynamic link library for host programming in C/C++ and other languages. It includes all basic commands for stepping motor control. Some examples of these functions are also enclosed. - USMCDLL.dll for Microsoft Windows Mobile 5.0 (which have just the same functionality as USMCDLL.dll for Microsoft Windows XP). - SMCVieW is a friendly graphical user interface for control, monitoring and tuning your stepping motors. It can also be used for easy setup and save/load of all parameters for each stepping motor. Interface supports up to 30 drivers simultaneously. - Cyclic Motion program - allows motion “from limit switch to limit switch” or “from point to point”. Included in SMCview inside “Extras” menu. - 2D Motion - allows driving two 8SMC1-USBhF controllers connected in schematic “XY translator”. Included in SMCview inside “Extras” menu, may require separate license. - ENGRAVING add-on - allows driving three 8SMC1-USBhF controllers connected in schematic “XYZ translator + laser beam shutter”. Included in SMCview inside “Extras” menu, may require separate license. - 3D Motion - allows driving three 8SMC1-USBhF controllers connected in schematic “XYZ translator”. Included in SMCview inside “Extras” menu, may require separate license. - ATTENUATOR program – this separate program allows driving Standa Motorized Variable Wheel Attenuator (10MWA168, 10MCWA168). By default shipping only with Standa motorized attenuator. May require separate license. A power supply (12V – 36V, 1.5A – 3.6 A) with KPPX-4P male power connector is required to operate the controller. You can use your own power supply or purchase STANDA power supplies. Warning: The Power driver IC fin (rear) is electrically connected to the rear of the chip. When current flows to the fin, the Power driver IC malfunctions. If there is any possibility of a voltage being generated between the ground of the 8SMC1-USBhF and the fin, either ground the fin or insulate it. Warning: There are appreciable power dissipation on Power driver (up to 6 W depending on input voltage and rated current of stepper motor). Appropriate heatsink must be used to maintain temperature range. Heating the Power driver over 85 °C is forbidden! Warning: Current sense resistors must be chosen for every stepper motor according to its rated current and connection diagram. For more details see 4.2.1. of User Manual. Wrong current sense resistors can cause the malfunction of 8SMC1-USBhF or damage stepper motor. Warning: There is some power dissipation on Voltage regulator (up to 0.5 W depending on input voltage). Appropriate heatsink may be required. Heating the Voltage regulator over 85 °C is forbidden! Warning: 8SMC1-USBhF power supply must never exceed 36 V. Power driver can be damaged if such exceeding happened. Warning: If a single power supply mode is used, make sure that input voltage is not exceeding 12 V. Otherwise the overheating of the Voltage regulator may happen. Heating the Voltage regulator over 85 °C is forbidden! Warning: Make sure that there are no contact between stepping motor phase windings and 8SMC1- USBhF ground. Power driver will be damaged obligatory if such grounding present. Warning: You must never connect to, or disconnect from the 8SMC1-USBhF any stepping motors while the controller keeps currents in the motor windings. Power driver can be damaged if such reconnection happened. Models ending with -1BR have 1 port designed for operating motor with a brake. This port is also compatible with motors without brake. Attention! 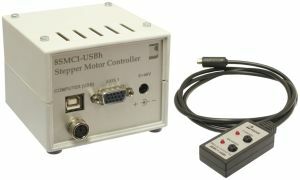 Model 8SMC1-USBhF has been upgraded to a motor controller of new generation - 8SMC4-USB. 8SMC1-USBhF is in stock for a transition period in quantities necessary for our long-term customers - system integrators.